IBM® CICS® Transaction Server Feature Pack for Dynamic Scripting embeds and integrates technology from WebSphere® sMash into the CICS TS V4.1 run time, helping to reduce the time and cost of CICS application development. The Feature Pack provides a robust, managed environment for a wide range of situational applications allowing PHP and Groovy developers to create reports, dashboards, and widgets, and integrate CICS assets into mash-ups, and much more. The CICS Dynamic Scripting Feature Pack combines the benefits of scripted, Web 2.0 applications with easy and secure access to CICS application and data resources. The Feature Pack includes a PHP 5.2 run time implemented in Java™ and with Groovy language support, support for native Java code and access to many additional libraries and connectors to enhance the development and user experience of rich Internet applications. Access to CICS resources is achieved by using the JCICS APIs. 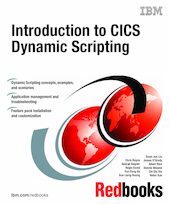 In this IBM Redbooks® publication, we introduce the Dynamic Scripting Feature Pack, show how to install and customize it, and provide examples for using it.